Just Nail-in': How to.... make your own flocking! For all you nail art beginners, flocking is the name of the stuff you put on your nails to give you the 'velvet' effect. As you can see velvet nails have an amazing look!! Now, from what I gathered from my extensive research (haha), flocking originated for scrap booking purposes. So one day some brilliant nail art pro decided to dip her wet nail polish into a tub of the stuff and hey presto VELVET NAILS! Pretty genius I think. So when I decided to make my 'Cookie Monster Nails' I actually did go to a scrap-booking place to get my very own royal blue flocking. BUT for someone who has limited cash, the tiny bottle of blue flocking was really expensive (at $8.50AUS). If you were to use it all the time or for all 10 nails then it would defiantly be worth it. BUT I just wanted to try it out on a couple of nails so I had to look for a cheaper alternative. *For all those lazy people out there and want to purchase it yourself you can get them from nail art supplies store online. Born Pretty Store sell a tub of one colour for about $4 USD. Or Ebay for about £1.50. 1. Buy what ever coloured ribbon you like. I got this one from Spotlight (Australian craft store) for about $2AUS. 2. Cut off a piece. I did them in 3 inch pieces. (Just easier to work with). 3. 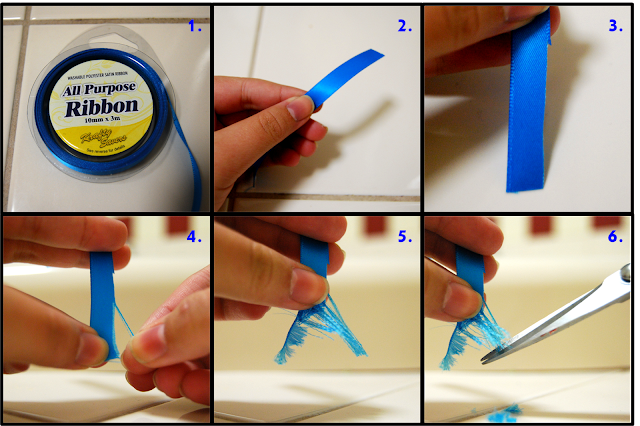 Next, you need to cut ONE side of the ribbon, just the end that holds all the tiny threads together. 4. Using you fingers slowly and carefully pull all the little threads out. 5. Once you have done a little section it should look like this. Notice that it has 'frayed on both sides - short and long ways. 6. Cut into tiny pieces, the smaller the pieces the better it looks on the nail. It took me about 10 mins to create enough flocking for 4 nails and I have PLENTY left over. This flocking (on my nails) lasted 3 days and it could have lasted a lot longer. I was really worried when I had a shower that is would all fall out or go a bit gross, but it was fine.